KOF RDTA Review - Daily Vaping Deals & The Best Vape Product Reviews at Vaping Cheap! Rebuildable dripping tank atomizers have become extremely popular within the last year, but most, if not all of them were primarily for dual coil builds. Hop N Vape has released their newest atomizer, the KOF RDTA, which features a single coil only build deck, which separates this atomizer from all of the rest. KOF stands for King of Flavor, which means this atomizer has got a lot to prove in this review. How does this RDTA compare to rest? We’ll see in this review! Before getting any further, I would like to thank Hop N Vape for sending this atomizer my way for the purposes of this review. I will go over my first impressions, building and wicking, performance, pros and cons, and conclude with whether or not I recommend this atomizer! Check out the KOF RDTA Here! Click Here to Check out the Hop N Vape KOF RDTA! Upon first receving the Hop N Vape KOF RDTA, what I noticed first was the familiar packaging. This same style of packaging can be found with the Rashomon RDA, which we reviewed recently right here. The packaging itself is quite compact, and everything within is secured properly, which is certainly a pro in my book. Right on the front of the packaging, you do see the KOF RDTA, and the only color currently available is stainless steel. 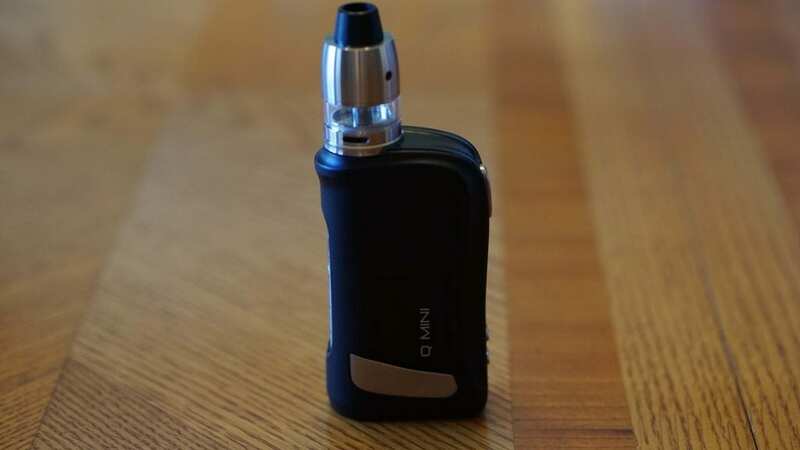 It would be nice to see this atomizer in other colors such as black. Upon opening the packaging, you are greeted with the KOF RDTA right away. What I first noticed about the atomizer is that it is a great size. It’s not too large nor is it too small. Also, the King of Flavor RDTA does sport an overall base diameter of 24mm, which is great since many vapers do prefer this diameter, and it would look great on almost any device you attach it to. The KOF does feature a unique design in my opinion, and I do think some vapers may not like its design. However, I was a fan of it when I first took a look at it, and held it in my hands. 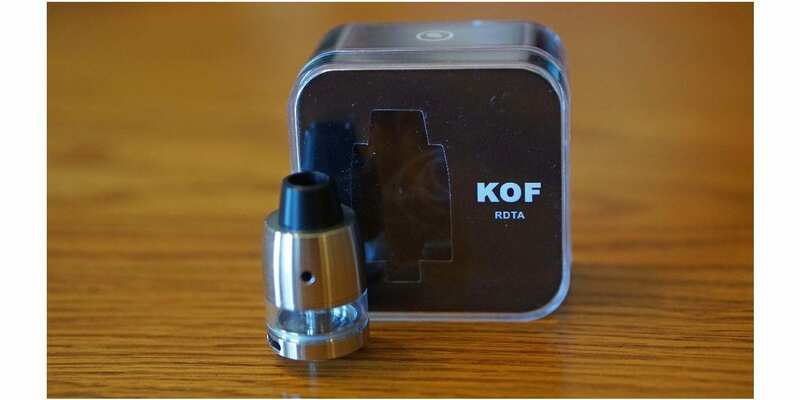 The overall quality of the KOF RDTA was solid just like the Rashomon RDA. I was actually quite surprised with its great quality, and all of the threading was smooth as well, which is a huge pro in my opinion, especially considering its price point. This atomizer does feature both side and bottom airflow. However, the bottom airflow is not adjustable, but the side airflow is. This may be seen as a con since both are not adjustable, but it’s not a huge issue for me. Regardless, it’s still something worth mentioning. Included in the packaging you do receive the King of Flavor RDTA, a spare glass tank section, spare o-rings, spare screws and an Allen key. It’s a huge pro once again with all of these extras, especially the spare glass tank section. It does also include a wide bore delrin drip, which can be taken off, and you can use your own preferred 510 drip tips if you prefer. Getting the included drip tip off was certainly a challenge. The top cap o-rings on this atomizer is excellent, and reminds me once again of the o-rings from the Rashomon RDA. The o-rings are not too tight nor are they too tight. I can easily hold this atomizer by the top cap and it will not come off. In addition, you don’t even need e-liquid to take the top cap on and off easily, that’s how great the o-rings are. This goes back to the excellent quality. In addition, the KOF RDTA came clean with no machine oil whatsoever. One wash with warm water, and this atomizer was good to go! This is a huge pro in my book, since it does annoy me when an atomizer comes drenched in machine oil. Even though it did come clean, I still recommend to always give your new atomizer a wash before using it. All in all, my first impressions of the Hop N Vape KOF RDTA was great. This was one of the first single coil only RDTAs that I’ve come across, and was certainly excited to get a build in it and start vaping it to see if it’s name fits! Like mentioned previously, the Hop N Vape King of Flavor RDTA features a single coil only build deck. When building for this atomizer, you do have to make sure each lead of your coil is of the opposite direction due to how it’s designed. There are slots on each side of the build deck to where each coil lead can be seated, and you can easily screw each coil lead down. The KOF does utilize grub screws, which may be seen as a con, especially vapers who hate using these type of screws, but I never ran into any issues with them. I could easily fit a Fused Clapton with no issues, but I do think bigger coil builds may be a tight squeeze, since there’s not a ton of room left with a single Fused Clapton. You can also do normal round wire builds as well, but due to its design it may prove to be a challenge when installing it. When you go to screw down on a thinner coil build, it can easily slide out of position when you are trying to secure your lead. This is definitely a con, but not the biggest issue in my opinion. Also, when you are installing your coil build, make sure to have your coil directly over the bottom airflow. Typically, this will naturally happen, which is surely a pro, and you can easily adjust the position of your coil once you do have it installed. I do recommend positioning the coil lower rather than higher to ensure better flavor. In addition, make sure when positing your coil that the side airflow is right at your coil as well. This can be done quite easily. I could easily get a build in this atomizer in less than 3 minutes without any issues. I do think beginners may not have the easiest time due to how the posts are designed, but experienced builders will have no issues whatsoever. 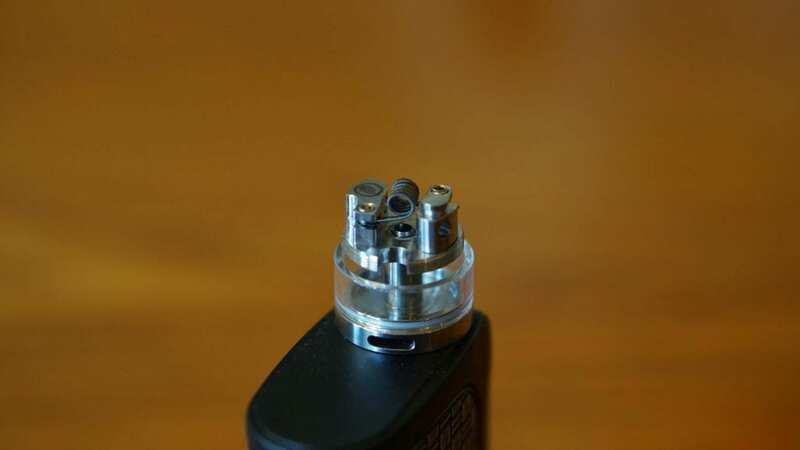 Wicking the KOF RDTA is extremely easy, especially if you’re used to wicking other RDTAs. You can unscrew the mid section, which makes wicking even easier in my opinion. I recommend cutting the cotton to where it will barely hang into the tank section. I found this to be the most effective way of wicking this atomizer, plus you have more room for e-liquid this way since cotton is not taking up space in the tank section. All in all, building and wicking this atomizer is fairly easy, especially if you’re experienced with building your own coils. Like mentioned previously, I do think beginners may have slight issues due to the build deck design, but they would probably get used to it quite quickly. 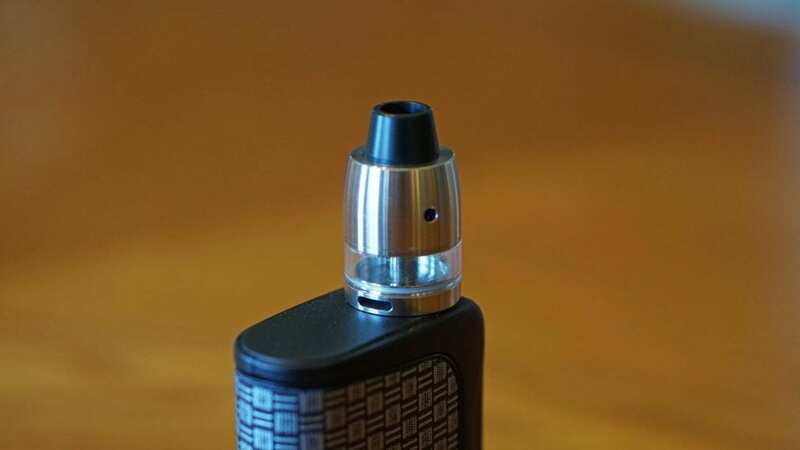 Trapping the leads without them slipping out of position is probably the only issue that can occur, but once it’s in, you’re good to go as wicking this atomizer is incredibly easy. Now, the most important question of this review is how does this RDTA perform, especially when it carries the name “King of Flavor”. I can easily say the performance of this atomizer is excellent, especially considering it’s a single coil RDTA! My preferred coil build for the KOF RDTA was a single Fused Clapton (26GA Kanthal/36GA Kanthal), which had a resistance of 0.45 ohm. My preferred wattage for this build was between 35w and 50w. I do want to mention that I did try other coil builds, which all performed great as well, but I do generally prefer Claptons or Fused Claptons over normal round wire builds. Also, I did notice the flavor was just a bit better with my preferred coil build over other round wire builds. Regardless, with the builds I put in this atomizer, they all performed well and I was satisfied. With that being said, with my preferred single Fused Clapton, the flavor was excellent, and honestly some of the best I’ve had in an RDTA. With the airflow coming from right under the coil, and directly hitting the side of the coil as well with the side airflow, the flavor is bound to be good. In addition, since the top cap does feature a conical design, it makes it even better. The vapor production was not lacking either, and I was certainly impressed with the vapor production from a single Fused Clapton in this atomizer. Also, I experienced no spitback even with a single Fused Clapton build, which is a huge pro! Like mentioned previously in the review, the KOF RDTA features both bottom and side airflow, but only the side airflow is adjustable. With the side airflow wide open, you get a nice restrictive lung hit. It’s not too airy, but just the right amount of restriction in my opinion, especially if you’re looking to flavor chase. This atomizer doesn’t provide you with massive amounts of airflow, so if that’s something you prefer, then the KOF probably won’t satisfy you. When closing off the side airflow, the flavor does increase a bit, but it is much more restrictive. I was actually surprised by how much more restrictive the vape was when closing off the side airflow. I much preferred to keep the side airflow wide open, as this is the way I prefer to vape. However, if you do like a very restrictive lung hit, you’d be satisfied with closing off the side airflow for sure. The Hop N Vape KOF RDTA has a 3ml e-liquid capacity, which is pretty decent considering its size. It can go e-liquid quite quickly, especially with a Fused Clapton build. Filling this RDTA is a bit different than any other RDTA that I’ve come across. The fill port is one of the airflow posts! All you have to do is take off the airflow post, and it reveals the fill port. You can tell which airflow post can come off, as it is slightly separated, and you do see a small gap between the post where your coil lead is and the airflow. I do want to mention that filling this tank can become quite messy, especially when using a glass bottle with a dripper cap or if you overfill it. E-Liquid tends to just spread all of the build deck when you’re filling it. Even though this can happen, I never experienced any leaking out of the bottom airflow hole. If you’re careful when filling this atomizer, then you probably won’t have any issues, but if you’re not then it can become a bit messy. All in all, the performance of the KOF RDTA was fantastic, especially being a single coil only atomizer. Both the flavor and vapor production was excellent, and it certainly lives up to its name “King of Flavor”! In conclusion, the Hop N Vape KOF RDTA is a solid performing single coil RDTA! I’m glad that Hop N Vape decided to go with a single coil only RDTA, as the market is filled with dual coil RDTAs, and it really helps separate this atomizer from the competition. The overall performance of this atomizer is excellent, and I had little to no issues with it during my time testing it. Yes, there were a few cons to be mentioned with this atomizer, but none that are deal breakers in my opinion. Sure, installing thinner coils may prove to be more time consuming, but it still can be done with ease, especially if you’re experienced with building. In addition, even though the bottom airflow is not adjustable, I would not see myself adjusting it even if it was adjustable, as this RDTA has a great amount of airflow when wide open. Like mentioned previously, the vapers who love tons of airflow, will probably not be satisfied with this atomizer. However, those vapers who love single coil builds, and looking to flavor chase will certainly be satisfied. All in all, the KOF RDTA is an excellent all around atomizer. If you’re looking for a new single coil RDTA with excellent flavor, then I can highly recommend the Hop N Vape KOF RDTA!